Email signatures have been integral component in email signatures for about two decades now. At first, individuals were hesitant in using email signatures as they disrupted the flow of an email thread. But now, professionals from across different fields and industries use email signatures on a consistent basis. It seems that these days, email signatures have become a top priority when sending emails. 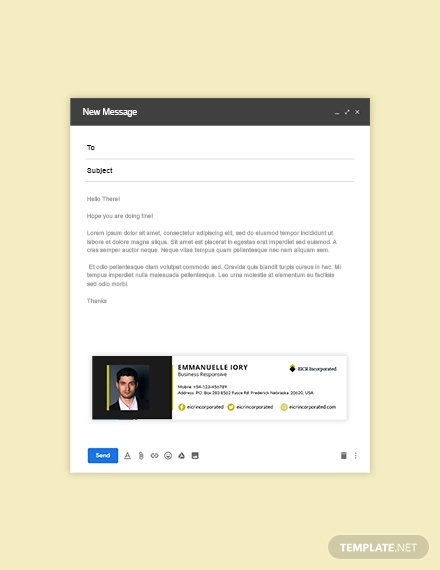 To help you create an email signature, we have provided some examples (in PSD and AI) which you will find useful. The examples need to be purchased, but they are affordable and can be easily edited once they have been purchased.You may also see formal email signature examples. Since you cannot use abstract designs, there are still other designs you can take advantage of. 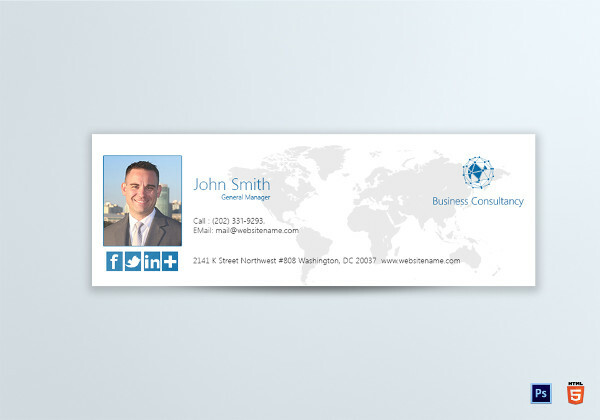 One suggestion would be using a business-related design or image and attaching it as a background. This is one of the easiest designs you can use, but one of the most popular as well. 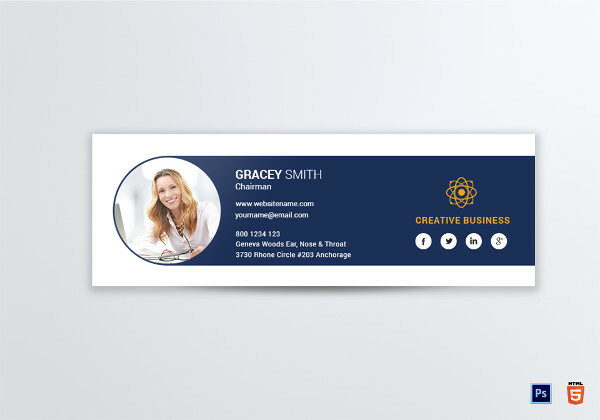 It makes minimum effort to use this design, and you should not have any problem attaching an image or photo in the background of the email signature, even if you don’t have any graphic design skills.You may also see business manager email signature examples. Another design which is simple yet attractive is the use of colors. Most likely, the color of the text you will be using is either black or white. These colors are neutral, thus any other color can be used. You can use color combinations as well, as this makes the email signature more attractive. Among the popular color combinations include blue-yellow, red-white, red-black, green-yellow, blue-white, and yellow-black. Three-color combinations are attractive as well, with red-white-blue, yellow-black-blue, and red-yellow-white being the most used combinations. An email signature is not complete without a photo. The photo which is inserted in the email signature adds to the professionalism and integrity of the said email signature. 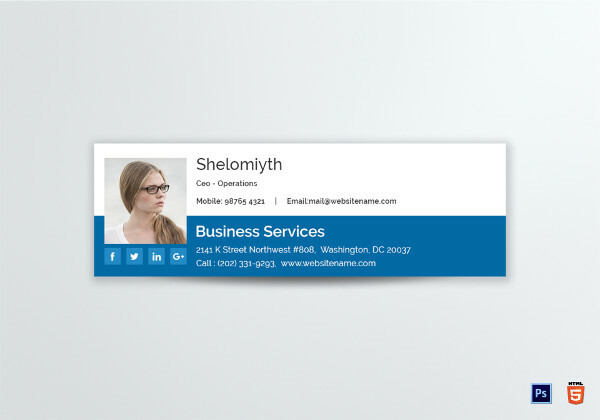 Since the email signature is a business tool, the photo to be inserted should also follow a professional format or look.You may also see company email signature examples. As previously mentioned, don’t make the email signature too large. The space in an email conversation is already limited as it is, so avoid creating an email signature which is as large as a poster or tarpaulin. Be careful when inserting too much in the email signature, as it makes the email signature too cluttered and messy. 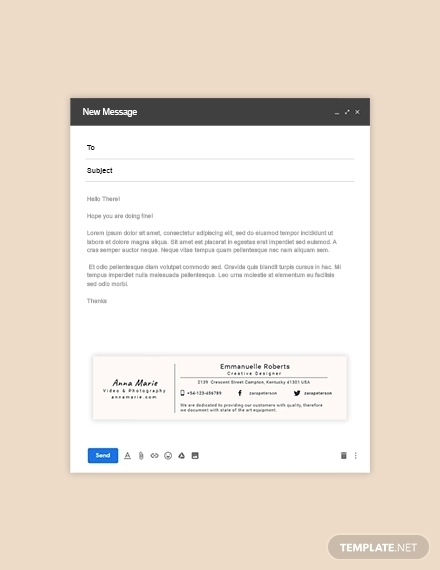 A cluttered email signature is not good to look at, so keep the designs to a minimum but make sure the text that needs to be presented is written down first.You may also see human resource email signature designs. Hyperlinks have become an integral part in email signatures. Not long ago, links can be copied but they were not clickable. 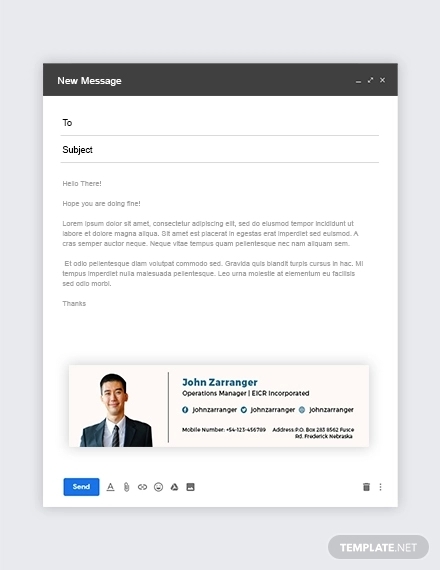 Today, hyperlinks are not only clickable but the links can be easily edited as well.You may also see tech startup email signature designs. You may be asking what kind of hyperlink you will be inserting in the email signature. If you are working for a company or organization, insert the hyperlink of your company. If you are an entreprenuer, insert the link to your company website. If you are a freelancer meanwhile with no affiliations to any organization, there is no need to insert a hyperlink. 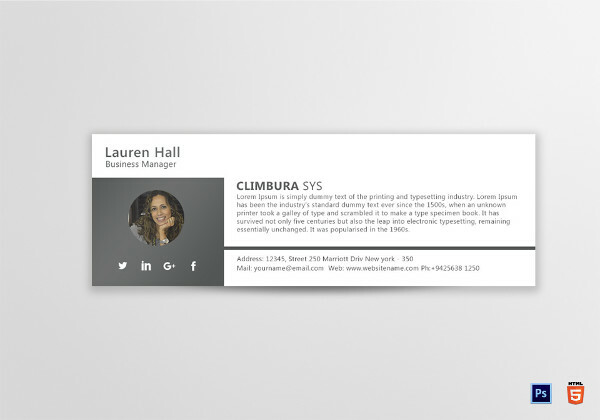 Avoid inserting links to your social media accounts such as Facebook, Instagram, Snapchat, and Twitter as they are too casual and don’t add anything significant to your email signature.You may also check out here printable corporate email signature designs & examples. Insert the hyperlink below the text. But you can always insert the link anywhere in the email signature as long as it can be easily seen by your email recipient. Motivation varies for different types of employees. But if there is one thing that motivates employees more is that their strengths are focused when working on daily tasks and responsibilities. Employees like to praised or get recognition when they do a good job, but they also like to work when they are given tasks which center on their strengths.You may also see training email signature designs. It is a fact that employees don’t like to be scolded or reprimanded. Although it is a common scenario where employees commit mistakes and get reprimanded after, employees who get reprimanded on a daily basis (and oftentimes for no varied reasons at all) do not positively affect their morale in any way. Even if a productive employee is doing a good job and still gets reprimanded, the faster he will leave the company, leaving a big hole in the company workforce.You may also check out here sales manager email signature examples. There are likely major goals which are set by the company which need to be implemented throughout the entire company or organization. But these goals are oftentimes too general and are difficult to achieve if not broken into smaller and specific goals. The manager or supervisor is responsible for breaking down the goals which will then be implemented to his respective team or subordinates. This coincides with setting personal and team goals which will eventually be very helpful in accomplishing their responsibilities in the workplace.You may also see college email signature examples. Setting personal goals does not always have to be related to the overall company goal. Personal goals can also relate to motivational and inspirational goals (i.e. change in mind set, improving work ethic, get to know colleagues on a more personal level, etc. ).You may also see web developer email signatures examples.